My one man show, 60 Years In The Business is in the pre rehearsal stage. I will update you as to the exact dates of the performances. It's my pleasure to announce that I will be appearing in the role of Heathersett in Me And MY Girl. 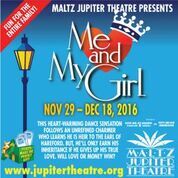 which will be performing at Maltz Jupiter Theatre in Jupiter Florida. Performances begin November 29th, 2016. The final performace will be on December 18th, 2016. Di Goldene Kale ( The Golden Bride) finished a successful run on August 28th, 2016. It was a rare pleasure being part of this Drama Desk nominated show which was also a New York Times Critic's pick and hailed by reviewers from every major New York paper and website. There is continual buzz about possible future productions of this wonderful piece. If this happens, I will look forward to reprising my role of Benjamin. Stay tuned. I returned from Vienna Austria this past October where I revisited my role of Oppenheimer in the Folksbiene Theatre's production of The Golden Land. I did this show 3 years ago Off Broadway in New York. The show was very well received and was recognized with a Drama Desk nomination. Our recent Vienna production was very successful. We performed at the Muth Theatre which is also the performance venue for the world famous Vienna Boys Choir. I look forward to doing this show again in the future. My show, 50 + Years In The Business had it's final performance on 4/20/2015 at 7:30pm at PS87 Theatre, 160 West 78th St., NYC. This was a benefit for Project Rushmore Theatre Company. The peformance was greeted by a standing ovation. To see some of the audience comments, go to my facebook page, https://www.facebook.com/bobader5 and take a look. Come and see my one man show, 50 + Years In The Business on April 19th at 3pm or April 20th at 7:30pm at PS87 Theatre, 160 West 78th St., NYC. These performances are fund raisers for Project Rushmore Theatre Company. I relate my more than 50 years in show business, through song, dance, variety perfoermances and lots of great stories. Reservations can be made at ProjectRushmoreNYC.org or by calling 212-927-6403. Ticket price is $30 (Discounts for Seniors, Students , and Entertainment Professionals with union cards). Hope to see you there. I appeared on ONE BAD CHOICE on MTV on Wednesday , March 4th, 2015 at 11PM playing the role of a mean judge in an espisode entitled Levi Sparks. The episode also was shown again on MTV on September 10th. Come me in a staged reading of The Value of Names on Jan. 20th, 2014 at 7pm at The Arclight Theatre - 152 West 71st Street, NYC. This production is being presented by Project Rushmore Theatre Comapny. The Golden Land was nominated for a 2013 Drama Desk Award. We were up against Broadway reivals such as Pippin, Mystery Of Edwin Drood. While we didn't win, just being nominated was great confirmation that this show deserves another life. If that happens, I'll be sure to let you know. The Golden Land officially closed on Sunday January 6th, 2013, but that may not be the endof the story. There is interest in possibly doing a production in Florida and maybe in several locations throughout the country. Check back here for updates. I have been a professional actor and performer for over 50 Years. Since my first appearance at the age of 6 in the ABC NY based televsion series, The Naked City, I have been spent my entire life dedicted to a professional career in the entertainment industry. I have been on Broadway, Off Broadway, Regional Theatre, Summer Stock, Dinner Theatre,Television, Feature Films, Industrial Presentations, Commercials, Voice Overs, Jingles, Radio, Recording, and Cabaret. Besides that, I am a twice produced playwright, and have recently had my first novel (Reflection Of Evil) published. My raison d'etre is to go the extra mile to do my best to entertain the public. As you navigate my website, you will see examples of my wide and varied background as a show business professional. Enjoy!